When the allure of highway robbery loses its lustre and pillaging—once a celebration of spontaneous mayhem— becomes a chore, it is time for a career change. Such was the case of Oaxaca's legendary banditos, Los Tres Diablos. Afflicted with a host of job-related maladies ranging from pistol-firing-induced hearing loss to ambusher's knee, the trio decided to close up shop and purchase a small sheep ranch in the State of Zacatecas where land was plentiful and government tax incentives favored outlaws of a certain age. Used to getting their way through a combination of intimidation and gun fire, the fearsome bandits found their tactics useless for shepherding. Even the tried-and-true method of taking hostages at gunpoint proved an ineffective means for corraling sheep. Where was the cringing compliance, the fearful obedience they had come to expect? 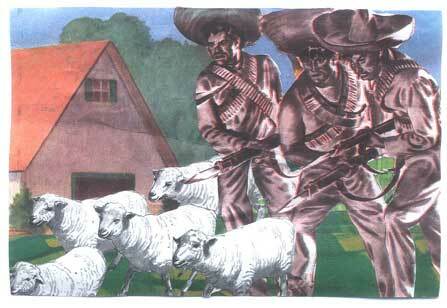 Los Tres Diablos had to face facts: extortion was no way to tend to a flock. The transition to animal husbandry was difficult. Compared to it, outlaw life seemed much simpler. Still, there was no denying that banditry was a young person's game. The one named Peligro pointed out, "Haven't we earned the right—albeit by ill-begotten means—to slow down and try something new?" The others concurred. And so, with cry of "Andalé", the men rose slowly from their seats raised their pistols and fired one last time in homage to their notorious past before shuffling off to the pasture to begin a new chapter in their lives.